Nissan has started production of the Leaf in Japan. Nissan's all-new 100 per cent electric, zero-emission Leaf, is scheduled to go on sale in December in Japan and the United States, and from early 2011 in select markets in Europe, including Ireland. In November, the company will begin exports to the United States, followed by shipments to Europe in December. “This is a significant milestone, not only for Nissan and the Renault-Nissan Alliance, but also for the entire automotive industry,” said Nissan president and CEO Carlos Ghosn at the Nissan Leaf offline ceremony. 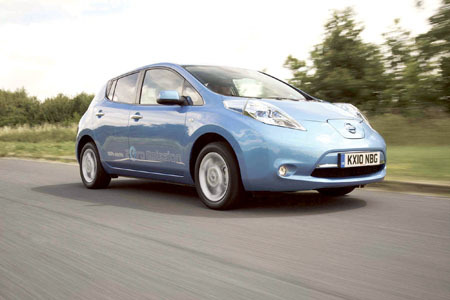 The Nissan Leaf will be produced in Japan alongside popular new petrol models such as Nissan Juke and Nissan Cube. Part of the assembly line has been modified to mount battery modules at the stage of production where fuel tanks are traditionally installed, and motors and inverters are mounted at the point where engines are installed in petrol-powered vehicles.